Our challenge in building the Socially Dynamic Organisation is not to build one unified tribe, but rather to interconnect the many. The thing that we want already exists: tightly trust bonded groups, repositories of tacit knowledge, effective ‘sense making’ entities. 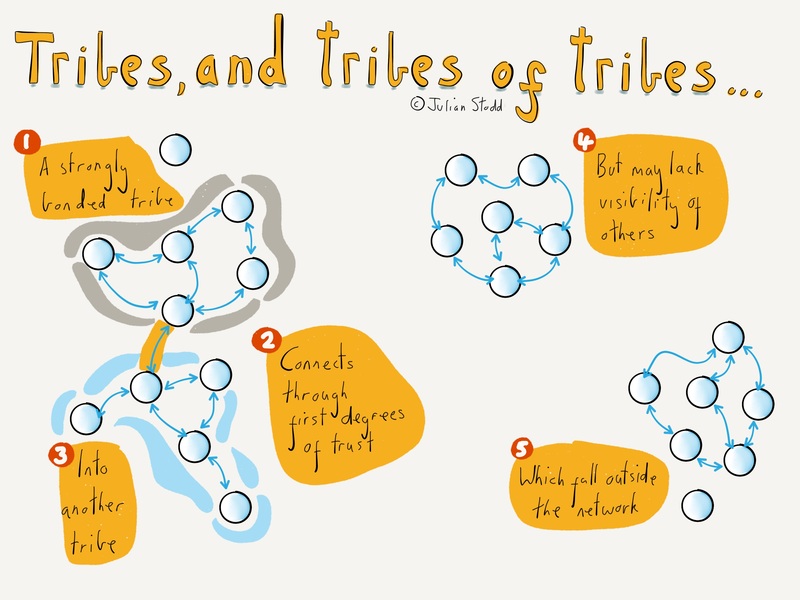 They exist, but they are fragmented: the Constrained organisation is made up of high functioning tribes, they just don’t related to or connect to each other in the right way, at the right level. This is important to understand: we are not specifically creating something new, but rather understanding the internal forces that hold together the social communities, and creating the conditions for those forces to thrive within a different matrix. The formal system itself (codified knowledge, hierarchical power, formal consequence) is not, in any case, able to directly create, or influence, the social one (trust bonded, multi layered, contextual, and dynamic). Partly because the social system is inherently defined in opposition to formal. That’s an interesting dynamic of coherence that i’ve been thinking about recently: some tribes are united in their interest or desire in some shared purpose, curiosity, or value, whilst others are united simply into their opposition of some third factor. ‘Consensus’ versus ‘oppositional’ power. If we consider the Trump dynamic in the US, we could read it that the opposition to his style and mandate specifically reinforces the ‘consensus’ of the believers: or perhaps flip that around, the very unity of the consensus of his supporters, spurs the oppositional power of a broad range of communities. Climate Change advocates, LGBTQ campaigners, transgender soldiers, liberals, and talk show hosts may be united in nothing but their opposition to his unified power. If this is true, then there is a specific advantage in interconnectivity: it allows us to more easily share the stories of opposition and, crucially, create a shared space for it’s dialogue: this shared narrative of dissent may be vital to the momentum of the message, and the unity of the opposition. Broadly though, i’m considering this: the Socially Dynamic Organisation may not have more tribes, or even more connections between them, but rather it has a greater diversity of the nature of those connections, more deeply cross connected. 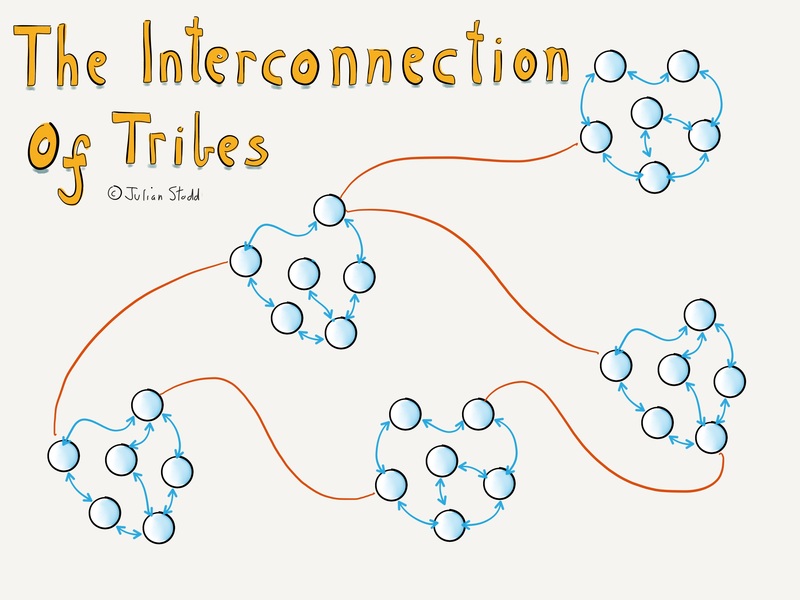 And not simply cross connected within tribal structures and known (accepted) stories, but more deeply connected through both formal and social structures, and engaged in active stories of shared dissent (this is why i disagree with you, and our discussion of it…). Shared stories of dissent seems to be an important part of this for me, and it’s that area that i’m prototyping at the moment. This entry was posted in Community and tagged Community, Culture, Hierarchy, Scale, Social Age, Social Power, Socially Dynamic Organisation, Structure, Tribes. Bookmark the permalink.